This week brings us three new Xbox Live Arcade titles, and lucky for us, one of them is co-op! 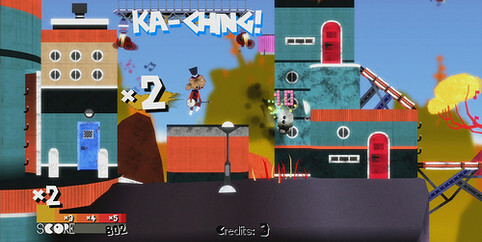 Fret Nice is a rather quirky looking game, a platformer with a music game influences. Two players can team up to play, though sadly they can only do so locally, and not online. You and your partner can battle "heavy metal bosses", and defeat enemies by "creating your own sounds with each "strum" of a chord". Add on a robust character cutomization system and the papercraft graphical style of the game, and Fret Nice appears to be worth checking out. It will be available Wednesday for the MS point equivalent of $15. Why not check out the Xbox.com entry or the official homepage in the meantime? Page created in 1.1852 seconds.